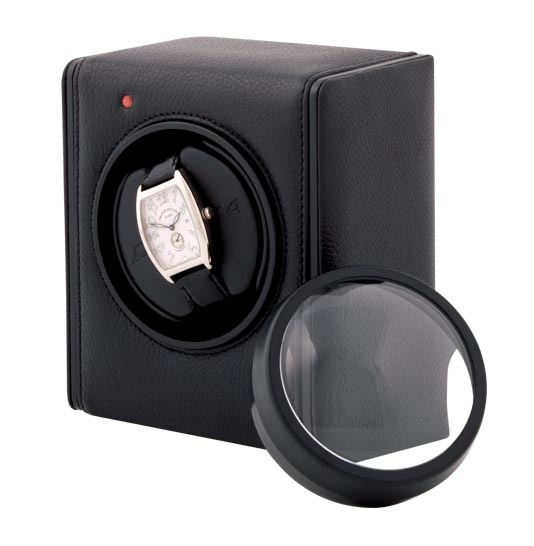 Compact in size but big in performance, this handy, single watchwinder operates by either batteries or supplied plug-in AC power. The BELLINO is fully user-programmable for turns per day (TPD) and winding direction and can also be set for automatic reversing. Available in lacquered Thai teakwood or hand-sewn Italian leather. The perfect size for traveling or for vault storage. When used in the battery mode, a warning light automatically signals the need for battery replacement well before winding performance is effected. A handy plug-in AC/DC adapter provides voltage conversion to 6 VDC and is included with each unit as is a removable magnifying lens and cover which slips into position for easy viewing and provides protection from dust and dirt.